Indie Canadian line Zoologist will introduce two new fragrances, Chameleon and Dodo, next month. Chameleon ~ A "tropical skin scent" developed by perfumer Daniel Pescio. "Like the luminescent skin of a reptile, fiery scales of sunlight ripple across the surface of the Indian Ocean, fading slowly to gold and finally sapphire as the sun sinks and disappears. The sea exhales, its gentle tide caressing the beach of an island paradise. The salty breath combines with the narcotic aromas of the ylang and frangipani trees in an intimate kiss, sending shivers through the branches. Something stirs – an eye pivots, a tail grips a slender bough. Will the creature vanish among the leaves, or flirt with a daring display of colour? No one knows. The secrets that lie beneath the skin of the chameleon keep Madagascar guessing. Madagascar, home to half of the world’s species of chameleons, holds the key to Zoologist Chameleon. Like the kaleidoscope of hues that swirl within the flesh of these exotic creatures, ylang dances with delicate frangipani upon your skin in a melody of creamy florals, while aphrodisiac vanilla blends with salty, silky musks to envelop you in the fruity, exotic atmosphere of the island. Whether you desire to shroud yourself in an air of mystery, or blatantly flaunt your true colours, Chameleon becomes you." Additional notes include bergamot, lemon, mango, pink pepper, star fruit, violet leaves, cashmeran, clove, coconut, jasmine, saffron, salty skin accord, sea breeze, amber, woods, opoponax, patchouli, sandalwood and vetiver. Dodo ~ a "peculiar fougère" developed by perfumer Joseph DeLapp. "The sun sparkled across rippling waves, its morning dance upon the Indian Ocean rousing the dodos from their carefree slumber. Stumbling drunkenly from their nests, the birds waddled through the sea of luscious ferns that carpeted the forest floor, to feast on fat, ripe berries. For generations, the island paradise of Mauritius nurtured the dodos, its predator-free and bountiful shores lulling them into a state of such complacency that even their wings grew idle, and flight was lost – even to memory. Ultimately their evolution would betray them cruelly, but while it lasted, the dodos enjoyed an existence marked by ease and comfort. Zoologist Dodo opens with an invigorating burst of tart lime and juicy berries, inviting you to venture deep into a forest dense with vibrant ferns. Delicate fiddleheads unfurl to reveal tendrils of feathery musk, as rosy florals float up to embrace them. Dodo is a paradox. Like those extinct inhabitants of Mauritius, the scent is at once classic and iconic, yet eerily unknowable and endlessly fascinating. The ideal fougère for those with an eclectic sensibility who crave a life of leisure and contentment." Additional notes include lychee, raspberry, ambergris, fir balsam, geranium, rose, musk, oakmoss, patchouli and sandalwood. 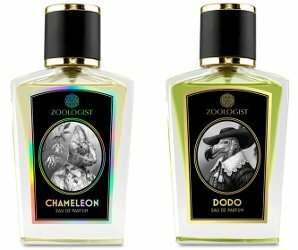 Zoologist Chameleon and Dodo can be pre-ordered now at Luckyscent, $145 each for 60 ml Eau de Parfum. Both sound fun. And this time, I enjoyed reading the ad copy! I was thinking something similar. Ordinarily, I detest that overwrought style of ad copy. Somehow in the case of Zoologist, I find it just more fun and tongue-in-cheek. You don’t suppose Dodo is already discontinued? That brings a whole new meaning to the phrase “limited edition”! I just made the connection – JKDeLapp of Rising Phoenix Perfume mentioned that he was going to bring Dodo to some event in March and I didn’t know why he would bring someone else’s perfume! As a chameleon owner, I’d buy that bottle no matter the juice.